At the outset of World War II, Denmark declared itself neutral. For most of the war, the country was a protectorate, then an occupied territory of Germany. The decision to occupy Denmark was taken in Berlin on 17 December 1939. 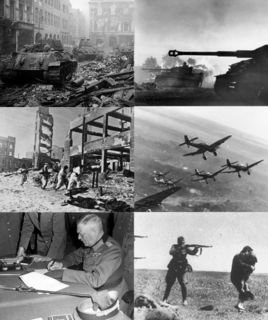 On 9 April 1940, Germany occupied Denmark in Operation Weserübung and the king and government functioned as normal in a de facto protectorate over the country until 29 August 1943, when Germany placed Denmark under direct military occupation, which lasted until the Allied victory on 5 May 1945. Contrary to the situation in other countries under German occupation, most Danish institutions continued to function relatively normally until 1945. Both the Danish government and king remained in the country in an uneasy relationship between a democratic and a totalitarian system until the Danish government stepped down in a protest against the German demands to institute the death penalty for sabotage. Free Corps Denmark was a Danish volunteer free corps created by the Danish Nazi Party (DNSAP) in cooperation with Nazi Germany, to fight the Soviet Union during the Second World War. On June 29, 1941, days after the German invasion of the Soviet Union, the DNSAP's newspaper Fædrelandet proclaimed the creation of the corps. Its formation was subsequently sanctioned by the democratically elected Danish government which authorized officers of the Danish Army to join the unit. The corps was disbanded in 1943. During the course of the war, approximately 6000 Danes joined the corps, including 77 officers of the Royal Danish Army. The Danish resistance movements were an underground insurgency to resist the German occupation of Denmark during World War II. Due to the initially lenient arrangements, in which the Nazi occupation authority allowed the democratic government to stay in power, the resistance movement was slower to develop effective tactics on a wide scale than in some other countries. The occupation of Denmark was initially not an important objective for the German government. The decision to occupy its small northern neighbor was taken to facilitate a planned invasion of the strategically more important Norway, and as a precaution against the expected British response. German military planners believed that a base in the northern part of Jutland, specifically the airfield of Aalborg, would be essential to operations in Norway, and they began planning the occupation of parts of Denmark. However, as late as February 1940 no firm decision to occupy Denmark had been made. The issue was finally settled when Adolf Hitler personally crossed out the words die Nordspitze Jütlands ("the Northern tip of Jutland") and replaced them with Dä, a German abbreviation for Denmark. Jutland, also known as the Cimbric or Cimbrian Peninsula, is a peninsula of Northern Europe that forms the continental portion of Denmark and part of northern Germany. The names are derived from the Jutes and the Cimbri, respectively. Aalborg Air Base also Air Transport Wing Aalborg is a military airbase for the Royal Danish Air Force. It is located at Vadum, near Aalborg, Denmark. Aalborg Air Base shares its runway system as well as some services with Aalborg Lufthavn. Southern Jutland is the name for the region south of the Kongeå in Jutland, Denmark and north of the Eider (river) in Schleswig-Holstein, Germany. The region north of the Kongeå is called Nørrejylland. Both territories had their own ting assemblies in the Middle Ages. Southern Jutland is mentioned for the first time in the Knýtlinga saga. OPROP! was a German leaflet dropped over several Danish cities at the German invasion of Denmark on April 9, 1940. The leaflets were signed by the head of Operation Weserübung Süd, General Leonhard Kaupisch. The text, written in broken but understandable Danish mixed with Norwegian, justified the German invasion as fraternally protecting Danish and Norwegian neutrality against British aggression, denounced Winston Churchill as a warmonger, and exhorted the Danish populace not to resist the German presence while an arrangement with the Danish government was being negotiated. As a result of the cooperative attitude of the Danish authorities, German officials claimed that they would "respect Danish sovereignty and territorial integrity, as well as neutrality." The German authorities were inclined towards lenient terms with Denmark for several reasons: their only strong interest in Denmark, that of surplus agricultural products, would be supplied by price policy on food rather than by control and restriction (some German records indicate that the German administration had not fully realized this potential before the occupation took place, which can be doubted);  there was serious concern that the Danish economy was so dependent upon trade with Britain that the occupation would create an economic collapse, and Danish officials capitalized on that fear to get early concessions for a reasonable form of cooperation;  they also hoped to score propaganda points by making Denmark, in Hitler's words, "a model protectorate";  on top of these more practical goals, Nazi race ideology held that Danes were "fellow Nordic Aryans," and could therefore to some extent be trusted to handle their domestic affairs. These factors combined to allow Denmark a very favorable relationship with Nazi Germany. The government remained somewhat intact, and the parliament continued to function more or less as it had before. They were able to maintain much of their former control over domestic policy. The police and judicial system remained in Danish hands, and unlike most occupied countries, King Christian X remained in the country as Danish head of state. The German Reich was formally represented by a Reichsbevollmächtigter ('Reich Plenipotentiary'), i.e. a diplomat accredited to the Sovereign, a post awarded to Cecil von Renthe-Fink, the German ambassador, and then in November 1942 to the lawyer and SS general Werner Best. Danish public opinion generally backed the new government, particularly after the fall of France in June 1940. There was a general feeling that the unpleasant reality of German occupation must be confronted in the most realistic way possible, given the international situation. Politicians realized that they would have to try hard to maintain Denmark's privileged position by presenting a united front to the German authorities, so all of the mainstream democratic parties formed a new government together. Parliament and the government agreed to work closely together. Though the effect of this was close to the creation of a one-party state, it remained a representative government. Stauning remained prime minister until his death in 1942, as head of a coalition cabinet encompassing all major political parties (the exceptions being the tiny Nazi party, and the Communist Party, which was outlawed in 1941 as discussed). Vilhelm Buhl replaced him briefly, only to be replaced by foreign minister Erik Scavenius, who had been the main link to the Nazi authorities throughout the war. Scavenius was a diplomat, not an elected politician, and had an elitist approach to government. He was afraid that emotional public opinion would destabilize his attempts to build a compromise between Danish sovereignty and the realities of German occupation. Scavenius felt strongly that he was Denmark's most ardent defender. After the war there was much recrimination over his stance, particularly from members of the active resistance, who felt that he had hindered the cause of resistance and threatened Denmark's national honour. He felt that these people were vain, seeking to build their own reputations or political careers through emotionalism. The success most often alluded to in regard to the Danish policy toward Germany is the protection of the Jewish minority in Denmark. Throughout the years of its hold on power, the government consistently refused to accept German demands regarding the Jews. The authorities would not enact special laws concerning Jews, and their civil rights remained equal with those of the rest of the population. German authorities became increasingly exasperated with this position but concluded that any attempt to remove or mistreat Jews would be "politically unacceptable." Even the Gestapo officer Dr. Werner Best, plenipotentiary in Denmark from November 1942, believed that any attempt to remove the Jews would be enormously disruptive to the relationship between the two governments and recommended against any action concerning the Jews of Denmark. According to Danish law, it was not illegal to join a foreign army, but active recruiting on Danish soil was illegal. The SS disregarded this law and began recruiting efforts – predominantly recruiting Danish Nazis and members of the German-speaking minority. The Danish government discovered this and decided to concentrate on persuading the Germans not to recruit underage boys. General Prior wanted to sack Kryssing and his designated second-in-command but decided to consult the cabinet. It agreed that Kryssing should be sacked in its meeting on 2 July 1941, but this decision was later withdrawn when Erik Scavenius—who had not attended the original meeting—returned from negotiations and announced that he had reached an agreement with Renthe-Fink that soldiers wishing to join this corps could be given leave until further notice. The government issued an announcement stating that "Lieut. Colonel C.P. Kryssing, Chief of the 5th Artillery reg., Holbæk, has with the consent of the Royal Danish Government assumed command over 'Free Corps Denmark'". The Danish text only explicitly said that the government recognized that Kryssing had been given a new command; it did not sanction the creation of the corps, which had already happened without its creators asking the government's consent. In July 1941 Heinrich Himmler complained that Denmark was unofficially trying to stop recruitment, since the word ran in the army that anyone joining would be committing treason. The government later instructed the army and navy not to obstruct applications from soldiers wishing to leave active duty and join the corps. On 20 November 1941, 5 months after the invasion of the USSR, the Danish government received a German "invitation" to join the Anti-Comintern pact. Finland accepted reluctantly on 25 November and stated that it presumed that Denmark would also attend the ceremony (effectively conditioning its own attendance). Erik Scavenius argued that Denmark should sign the pact but the Cabinet ministers refused, stating that this would violate the policy of neutrality. Scavenius reported this decision to Renthe-Fink. Fink replied on 21 November that "Germany would be unable to comprehend" a Danish rejection and demanded this decision be reversed before the end of the day. He assured Scavenius that the pact contained neither "political or other obligations" (i.e., going to war with the USSR). At a cabinet meeting the same day, it was suggested to seek a written confirmation of this promise in an addendum to the protocol. Stauning agreed on these terms, since it would effectively make the signing meaningless. The Danish foreign office drew up a list of four terms that stated that Denmark only committed itself to "police action" in Denmark and that the nation remained neutral. The German foreign ministry agreed to the terms, provided that the protocol was not made public, which was the intent of the Danish foreign ministry. As the war dragged on, the Danish population became increasingly hostile to the Germans. Soldiers stationed in Denmark had found most of the population cold and distant from the beginning of the occupation, but their willingness to cooperate had made the relationship workable. The government had attempted to discourage sabotage and violent resistance to the occupation, but by the autumn of 1942 the numbers of violent acts of resistance were increasing steadily to the point that Germany declared Denmark "enemy territory" for the first time. After the battles of Stalingrad and El-Alamein the incidents of resistance, violent and symbolic, increased rapidly. In anticipation of Operation Safari, the Danish Navy had instructed its captains to resist any German attempts to assume control over their vessels. The navy managed to scuttle 32 of its larger ships, while Germany succeeded in seizing 14 of the larger and 50 of the smaller vessels (patruljekuttere or "patrol cutters"). The Germans later succeeded in raising and refitting 15 of the sunken ships. During the scuttling of the Danish fleet, a number of vessels were ordered to attempt an escape to Swedish waters, and 13 vessels succeeded in this attempt, four of which were the larger ships; two of the larger vessels had remained at safe harbour in Greenland. The coastal defence ship HDMS Niels Juel attempted to break out of the Isefjord, but was attacked by Stukas and forced to run aground. By the autumn of 1944, the ships in Sweden officially formed a Danish naval flotilla in exile. In 1943, Swedish authorities allowed 500 Danish soldiers in Sweden to train themselves as "police troops". By the autumn of 1944, Sweden raised this number to 4,800 and recognized the entire unit as a Danish brigade in exile. Danish collaboration continued on an administrative level, with the Danish bureaucracy functioning under German command. The Gestapo had limited trust in the Danish police, which had a total 10,000 members. 1,960 of these were arrested and deported to Germany on 19 September 1944. The country, at least certain sections of it, did so well that it has been open to the accusation of profiteering from the war. After the war there was some effort to find and punish profiteers, but the consequences and scope of these trials were far less severe than in many other countries, largely a reflection of the general acceptance of the realistic need for cooperation with Germany. On the whole, though the country fared relatively well, this is only a relative measure. Phil Giltner has worked out that Germany had a "debt" of roughly 6.9 billion kroner to Denmark as a whole. This means that they had taken far more out of the Danish economy than they had put in, aside from the negative side effects of the war on trade. The Danish National Bank estimates that the occupation had resulted in the printing press increasing the currency supply from the pre-war figure of 400 million kroner to 1,600 million, much of which ended up in the hands of war profiteers. In July 1945, two months after the liberation of Denmark, the Danish Parliament passed an emergency law initiating a currency reform, making all old banknotes void. A small number of employees at the National Bank had clandestinely begun the production of new banknotes in late 1943. The production of new notes happened without the knowledge of the German forces located at the bank, and by the spring of 1945 the bank's stock of notes was sufficient to initiate the exchange. The law required was passed hastily on Friday 20 July and published the same day; it also closed all shops for the weekend. By Monday 23 July, all old notes were officially outlawed as legal tender and any note not declared in a bank by 30 July would lose its value. This law allowed any Dane to exchange a total of 100 kroner to new notes, no questions asked. An amount up to 500 kroner would be exchanged, provided the owner signed a written statement explaining its origins. Any amount above this level would be deposited in an escrow account and only released or exchanged following scrutiny by tax officials examining the validity of the person's statement about the origins of this wealth. All existing bank accounts were also scrutinized. Multiple exchanges of cash by the same person were avoided by the requirement that currency would only be exchanged to anybody also handing in a specified ration stamp, previously issued in a different context, which had not yet been authorized for use. The exchange resulted in a significant drop in the currency supply, and around 20% of the 3,000 million kroner property declared had not previously been registered by the tax authorities. Estimates vary for the amounts of currency simply destroyed by its owners. All banknotes issued since the changeover date remain valid indefinitely; earlier ones are not valid. 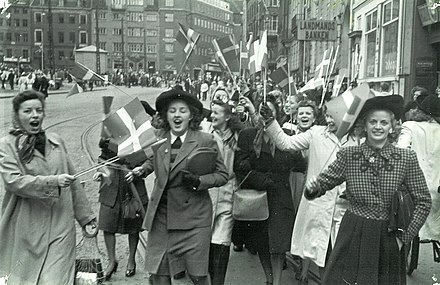 Although Denmark was spared many of the difficulties other areas of Europe suffered, its population still experienced hardships, particularly after the Germans took charge in 1943. Yet on the whole, Denmark can be said to have suffered the least of all the European combatants from the war. Many were killed and imprisoned because of their work resisting the German authorities. There were small bombing raids on select targets in the country, but nothing comparable to that suffered by, for instance, neighbouring Norway or the Netherlands. One area that was badly damaged was the island of Bornholm, largely due to Soviet bombardment of the German garrison there in the very last days of the war. Approximately 6,000 Danes were sent to concentration camps during World War II,  of whom about 600 (10%) died. In comparison with other countries this is a relatively low mortality rate in the concentration camps. In some of the camps, food rations were scarce and medical care was inadequate. In 1945 alone, more than 13,000 people died, among them some 7,000 children under the age of five. The situation was worst in the months right before and after the capitulation, when Danish hospitals and doctors were reluctant to treat German refugees. The reason for this was not only anti-German resentment, but also lack of resources, the time needed to rebuild administrative structures, and the fear of epidemic diseases which were highly prevalent among the refugees. Instead, Danish authorities established a camp-internal medical system with German medical personnel, which took some time to work adequately. In the camps, there was school education for children up to the upper secondary level, work duty for adults, study circles, theatre, music and self-issued German newspapers. After initial inadequacy, food rations became more sufficient. ↑ "The diaries: Quisling sealed Denmark's WWII fate". Politico.dk. 20 December 2013. ↑ Laursen, Gert (1997). "The Occupation in Numbers". milhist.dk. Archived from the original on 6 March 2012. Retrieved 24 December 2016. ↑ Christensen, Claus Bundgård; Poulsen, N. B.; Smith, P. S. (2006). Under hagekors og Dannebrog : danskere i Waffen SS 1940–45[Under Svastika and Dannebrog : Danes in Waffen SS 1940–45] (in Danish). Aschehoug. pp. 492–494. ISBN 978-87-11-11843-6. ↑ Caruso, Jesper Dahl (20 March 2014). "Oprejsning til danske krigssejlere". nyheder.tv2.dk . Retrieved 24 December 2016. 1 2 3 Henrik Dethlefsen, "Denmark and the German Occupation: Cooperation, Negotiation, or Collaboration," Scandinavian Journal of History. 15:3 (1990), pp. 193, 201-2. 1 2 Jørgen Hæstrup, Secret Alliance: A Study of the Danish Resistance Movement 1940–45. Odense, 1976. p. 9. ↑ Hendriksen, C. Næsh (ed.) (1945). Den danske Kamp i Billeder og Ord (in Danish). Odense: Bogforlaget "Dana". p. 18. CS1 maint: Extra text: authors list (link) Photo taken near Bredevad in Southern Jutland. ↑ William Shirer, The Rise and Fall of the Third Reich (New York: Simon & Schuster, 1990), p. 663. ↑ Flemming Østergaard, (19 March 2010). "Dan Hilfling Petersen: 9. april 1940 — hele historien. Hvad der virkelig skete" [The whole history; what really happened]. Jyllands-Posten . (Subscription required (help)). ↑ Mogens R. Nissen: "Prices on food 1940–1945: Nazi price policy in occupied Denmark", Nord-Europa Forum (2004:1) p. 25-44. Accessed 14 December 2012. 1 2 3 4 Phil Giltner, "The Success of Collaboration: Denmark’s Self-Assessment of its Economic Position after Five Years of Nazi Occupation," in Journal of Contemporary History 36:3 (2001) pp. 486, 488. 1 2 Henning Poulsen, "Hvad mente Danskerne?" Historie 2 (2000) p. 320. 1 2 3 4 5 6 Jerry Voorhis, "Germany and Denmark: 1940–45," Scandinavian Studies 44:2 (1972) pp. 174-6, 179, 181, 183. ↑ "Hvad var det, der skete den 29. august 1943 tidligt om morgenen?" [What was it that happened on 29 August 1943 early in the morning?] (in Danish). Norwegian Armed Forces. 29 August 2003. Archived from the original on 27 September 2007. ↑ John Oram Thomas, The Giant Killers, (London: 1975), p. 13. ↑ Andrew Buckser, "Rescue and Cultural Context During the Holocaust: Grundtvigian Nationalism and the Rescue of Danish Jews", Shofar 19:2 (2001) p. 10. ↑ Harold Flender, Rescue in Denmark, (New York: 1963) p. 30. ↑ "Vesterbro under den anden verdenskrig" [Vesterbro during World War II](PDF) (in Danish). Archived from the original (PDF) on 25 August 2006. 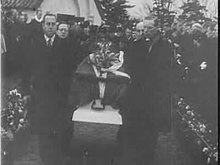 ↑ Kaarsted, Tage (1976) De danske ministerier 1929–1953(in Danish). Pensionsforsikringsanstalten, p. 220. ISBN 87-17-05104-5. ↑ Jørgen Hæstrup (1979), "Departementschefstyret" in Hæstrup, Jørgen; Kirchhoff, Hans; Poulsen, Henning; Petersen, Hjalmar (eds.) Besættelsen 1940–45(in Danish). Politiken, p. 109. ISBN 87-567-3203-1. ↑ Den Danske Brigade "Danforce", Sverige 1943–45. Accessed 14 December 2012. ↑ United States Holocaust Memorial Museum: Biography of Preben Munch-Nielsen Archived 14 June 2007 at the Wayback Machine . ↑ "Gads leksikon om dansk besættelsestid 1940–1945" Published 2002. Page 178. ↑ 19. September by Carl Aage Redlich, published 1945, page 11. ↑ Ruth Meyer-Gohde: "Dänemarks wirtschaftspolitische Reaktion auf die Besetzung des Landes 1940/41", Nord-Europa-Forum (2006:2), p. 51-70 (in German). Accessed 14 December 2012. 1 2 Historiske snapshot, Pengeombytning Archived 8 November 2006 at the Wayback Machine , 5 October 2011, Nationalbanken. Accessed 14 December 2012. ↑ Michael Schultheiss: "Ob man an die kleinen Kinder gedacht hat ...? Die Verhandlungen über medizinische Hilfe für deutsche Flüchtlinge in Dänemark am Ende des Zweiten Weltkriegs" in Nord-Europa-Forum (2009:2) p. 37-59 (in German). Accessed 14 December 2012. ↑ Bjørn Pedersen: Tyske flygtninge (German refugees), 2 May 2005, befrielsen1945.dk (in Danish). Accessed 14 December 2012. 1 2 Bertel, Haarder (21 September 2005). "Nye myter om samarbejdspolitikken" [New myths about the "cooperation policy]. Information (in Danish). Retrieved 14 February 2013. ↑ Stenstrup, Brita (8 November 2003). "Kampen om Scavenius' eftermæle" [The fight for Scavenius's Legacy]. Berlingske Tidende (in Danish). Retrieved 14 February 2013. ↑ "Foghs opgør med samarbejdspolitikken er strandet" [Foghs showdown with cooperation stranded]. Information. 4 May 2009. Retrieved 21 November 2015. ↑ "Denmark: Apology For Cooperation With Nazis". The Associated Press . 30 August 2003. Retrieved 24 December 2016– via The New York Times. ↑ Nils Arne Sørensen, "Narrating the Second World War in Denmark since 1945." Contemporary European History 14.03 (2005): 295-315. Christian X was King of Denmark from 1912 to 1947, and the only King of Iceland between 1918 and 1944. Erik Julius Christian Scavenius was the Danish foreign minister from 1909–1910, 1913–1920 and 1940–1943, and prime minister from 1942 to 1943, during the occupation of Denmark until the Danish elected government ceased to function. He was the foreign minister during some of the most important periods of Denmark's modern history, including the First World War, the plebiscites over the return of northern Schleswig to Denmark, and the German occupation. Scavenius was a member of the Landsting from 1918 to 1920 and from 1925 to 1927 representing the Social Liberal Party. He was chairman of its party organization from 1922 to 1924. Frits Clausen was leader of the National Socialist Workers' Party of Denmark (DNSAP) prior to and during World War II. Vilhelm Buhl was Prime Minister of Denmark from 4 May 1942 to 9 November 1942 as head of the Unity Government during the German occupation of Denmark of World War II, until the Nazis ordered him removed. He was Prime Minister again from 5 May 1945 to 7 November 1945 as head of a unity government after the liberation of Denmark by the British Field Marshal Montgomery. Frøslev Camp was an internment camp in German-occupied Denmark during World War II. 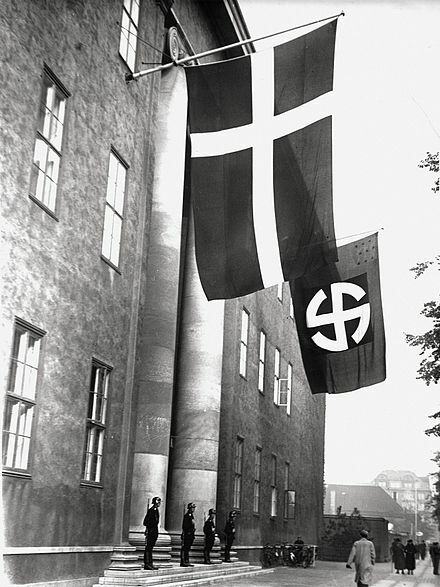 The National Socialist Workers' Party of Denmark was the largest Nazi Party in Denmark before and during the Second World War. 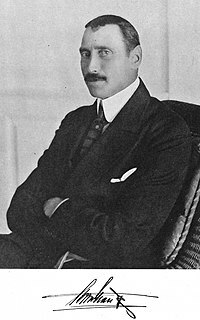 Cécil Karl-August Timon Ernst Anton von Renthe-Fink (1885–1964) was a German diplomat. He was plenipotentiary of Denmark from 9 April 1940 until 1942. 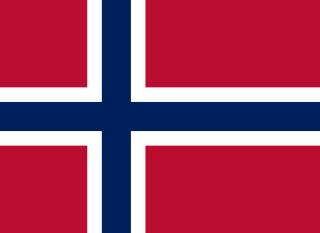 In 1941–1942 during the occupation of Norway by Nazi Germany, there were at least 2,173 Jews in Norway. At least 775 of them were arrested, detained and/or deported. More than half of the Norwegians who died in camps in Germany were Jews. 742 Jews were murdered in the camps and 23 Jews died as a result of extrajudicial execution, murder and suicide during the war, bringing the total of Jewish Norwegian dead to at least 765 Jews, comprising 230 complete households. "Nearly two-thirds of the Jews in Norway fled from Norway". Of these, around 900 Jews were smuggled out of the country by the Norwegian resistance movement, mostly to Sweden but some also to the United Kingdom). Between 28 and 34 of those deported survived their continued imprisonment in camps —and around 25 returned to Norway after the war. The Telegram Crisis was a diplomatic crisis between Denmark and Germany in October and November 1942, during the German occupation of Denmark. Denmark–Germany relationsare the foreign relations between Denmark and Germany. 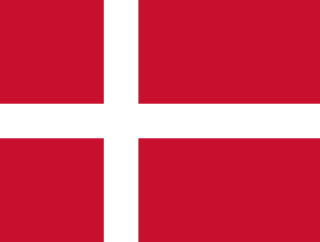 Denmark has an embassy in Berlin and three general consulates in Flensburg, Hamburg and Munich. Both countries are full members of NATO and of the European Union. The border between the countries, which lies in the Schleswig region, has changed several times through history, the present border was determined by referendums in 1920. The Danish-German border area has been named as a positive example for other border regions. Substantial minority populations live on both sides of the border, and cross-border cooperation activities are frequently initiated. Events from the year 1943 in Denmark. 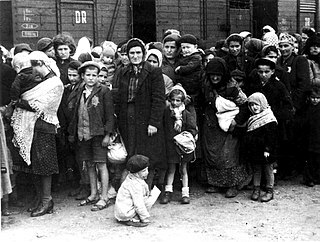 The Holocaust in Italy was the persecution, deportation, and murder of Jews between 1943 and 1945 in the Italian Social Republic, the part of the Kingdom of Italy occupied by Nazi Germany after the Italian surrender on September 8, 1943, during World War II. The Scavenius Cabinet was the government of Denmark from 9 November 1942 to 5 May 1945. It replaced the Buhl I Cabinet, which fell due to the Telegram Crisis in November 1942, when the Germans demanded changes to the Danish government. The Germans wanted nonpolitical ministers and Nazi ministers in the new government, however only the first demand was met. Following the August Rebellion in 1943, the Germans put forward more demands, which the Danish authorities refused. The government therefore filed a resignation request for the King on 29 August 1943, who refused to accept it. The government de facto ceased to function, though still formally in power. The Board of the Heads of Department was established, where the ministries and directors of the ministries managed the country. Only after the liberation of 5 May 1945, were the resignation accepted, and the Scavenius Cabinet and Board of the Heads of Department were replaced by the Buhl II Cabinet.